GUILD (Genes Underlying Inheritance Linked Disorders) is a framework built for the prioritization of disease candidate genes using a priori gene-disease associations and protein interactions. GUILD consists of implementations of 8 algorithms: NetScore, NetZcore, NetShort, NetCombo, fFlow, NetRank, NetWalk and NetProp. NetScore, NetZcore, NetShort, fFlow and NetRank are implemented in C++ while NetWalk and NetProp are implemented in R and NetCombo is a Python script combining the results of NetScore, NetZcore and NetShort. In this manual, we describe how to use these programs included in GUILD framework. See github repository for the latest version of the code. For Python scripts used to create input files see guild_utilities in toolbox package. The software used in GUILD framework is distributed freely under GNU Public License. Download the source code, example input files and the software manual here. See handbook either in the downloaded archive (under "doc" directory) or below for the instructions on installation and usage. A PDF version of the handbook is also provided for convenience. Unix-like operating systems typically ship with these programs. If not these programs are freely available online. Note that, Windows users can have the fundamental environment for the installation (GCC and make) through MinGW (http:// http://www.mingw.org ) or Cygwin ( http://www.cygwin.com ). R is a free software environment for statistical computing and graphics and available at http://www.r-project.com /. Next, go to the src folder and issue make command as below. Beware that make command in MinGW can have a different name (e.g. mingw32-make.exe) MacOS users: use make -f Makefile.mac instead of make command below (available in the github version of the code). If you get the following output when you run it, the installation is successfully completed. Otherwise make sure that you have recent versions of GCC and make installed, check the steps above and retry compiling. If you encounter compilation issues due to BOOST code, try compiling using a newer version of BOOST library (changing the BOOST lib path in the Makefile). where all arguments are as explained before except ``use_propagation'', which -if provided- converts NetWalk algorithm to NetProp. NetScore adopts a message-passing scheme such that each node sends the information associated with it as a message to all of its neighbours and the neighbours convey these messages to their neighbours. NetScore takes into consideration alternative shortest paths within the distance of at most number_of_iterations links at each so called repetition-cycle. At the end of the repetition cycle, the node scores are updated according to messages recieved so far and the message passing is restarted. The number of resets (updating the scores of the nodes to calculated scores so far) in the algorithm. Defines the reach of the method (number of links to look further while calculating score) in accordance with the number_of_iteration parameter. Number of iterations to apply the scoring step of the prioritization algorithm. 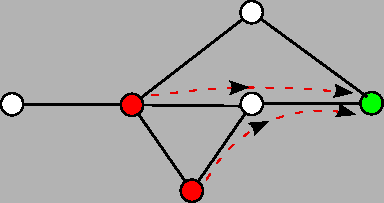 That is the length of shortest paths to consider from a node to other nodes (messages of the nodes that are this many links further are considered). The following is an example call to run NetScore algorithm using node file node_score.txt and edge file edge_score.txt with number of iteration and repetition parameters of 2 and 3 respectively, writing the calculated scores to a file named output.txt. NetZcore assigns a normalized score using the distribution of the scores of neighbouring nodes. 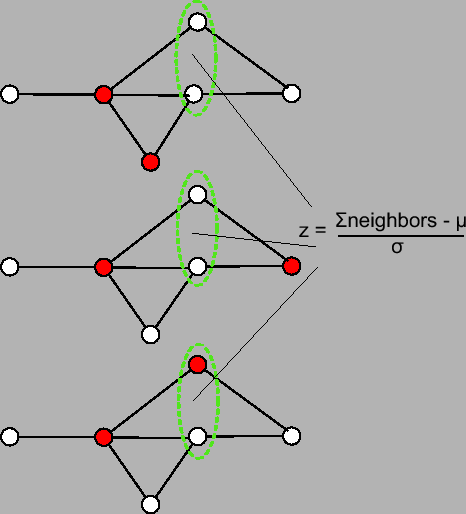 The normalization uses a random model of networks and it is calculated with the Z-score formulae: z=(x-m)/s, where m is the average of scores of neighbouring nodes with similar distribution in the random network and s is the standard deviation. The distribution is obtained with hundred network-replicates obtained by randomly shuffling the scores among nodes with similar degree (i.e. 100 random networks preserving the original topology). Number of iterations to apply the scoring step of the prioritization algorithm. Number of the sampled networks (random networks with similar characteristics -e.g. topology or degree distribution- of original network) used for calculating expected mean and standard deviation of scores by random. The full prefix of the sampled networks. An integer from 1 to n_sampled_graphs will be appended at the end of this text while reading sampled networks (thus it should include the directory under which random network files reside). Note that the program itself does not create random networks and looks for already existing random networks residing under the path given by this parameter. A python script is provided for creating such networks (see below). A python script named ``create_random_networks_for_netzcore.py'' is provided for creating random networks that are going to be used by NetZcore. It requires Python (version 2.5.2 or higher) and Python NetworkX (version 1.1 or higher) package to be installed in your system. The following command would create 100 random networks with the same topology of given input network ``data/test_interactions.txt'' with the prefix of ``data/test_interactions.txt.'' (appends a dot at the end of the provided egde scores file name). 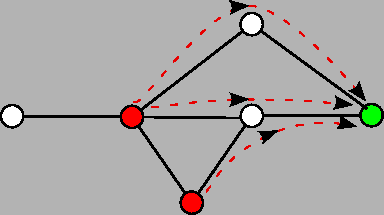 NetShort accumulates the weighted shortest path lengths between a node and the rest of nodes in the network, where each edge-weight is inversely proportional to the average of the scores of the two nodes connected by the edge (i.e.edges connecting high scoring nodes are shorter). There is no method specific parameter for NetShort, however note that algorithm uses the phenotypic association scores in the edge scores file (edge_file) rather than the node scores file (e.g. the average of the scores of the nodes the edge in concern connects). A python script to create netshort specific edge scores file is provided for convenience (see below). A python script named ``convert_network_for_netshort.py'' is provided for creating edge scores file that is going to be used by NetShort (where original edge scores are multiplied by average of the scores of the nodes the edges belong to). It requires Python (version 2.5.2 or higher). The following command would convert the original edge scores file ``data/test_interactions.txt'' to a NetShort specific ``data/test_interactions_for_netshort.txt'' egde scores file using node scores information in ``data/test_proteins.txt''. In fFlow (based on the algorithm of Functional Flow in Nabieva et al. 2005), at each iteration, annotation scores flow from nodes with higher score towards nodes with lower scores at the amount of the capacity of the edge through which the nodes are connected. All the nodes that have higher than this given threshold score will be considered as seeds for the method and assigned infinite scores during scoring. NetRank (based on the ToppGene algorithm proposed by Chen et al. 2009) uses Page Rank with priors algorithm (where a random surfer is more likely to end up in initially relevant nodes) to score a node in terms of phenotypic relevance. The damping factor is 0.15 and the number iterations for convergence is defined by the number_of_iterations parameter (see below). Number of iterations to apply the scoring step of the prioritization algorithm. In the case of Page Rank algorithm it defines the number of the times for calculating page ranks for the nodes (convergence criterion for the algorithm). This number is set to 20 by default. NetWalk (based on the Random walk with restarts algorithm proposed by Kohler, et al., 2008) iteratively simulates random transitions of a walker from a node to a randomly selected neighbour node and where at any time step the walk can be restarted depending on a predefined probability. Random walk with restarts is slightly different than PageRank with priors in the way that it normalizes the link weights. The convergence is decided by either having a probability difference less than 10e-6 between two consecutive time steps or achieving the limit of the number of iterations, set to 50 (though in practice less than 20 iterations are typically sufficient to satisfy the first criterion). There is no method specific parameter for NetWalk. NetProp (based on the Network propagation algorithm proposed by Vanunu, et al., 2010) modifies random walk with restarts such that the link weight is normalized not only by number of outgoing edges but also by number of incoming edges. The convergence is decided as it is done for NetWalk. There is no method specific parameter for NetProp. NetCombo combines the output scores from NetScore, NetZcore and NetShort in a consensus scheme by averaging normalized scores (z-scores) of a node in all of these methods. It requires the output files of NetScore, NetZcore and NetShort. Copyright 2011 GUILD (software). All Rights Reserved.